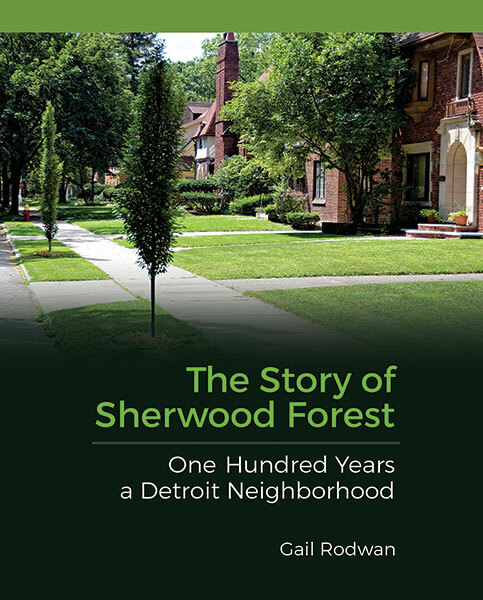 THE STORY OF SHERWOOD FOREST: ONE-HUNDRED YEARS A DETROIT NEIGHBORHOOD tells the story of a group of creative and tenacious people and the place they have chosen to call home. The development of the Sherwood Forest community in the 1920s, 30s, and 40s, mirrored the development of the auto industry in Detroit. Auto executives bought lots and had fine homes built for their families in what came to be called “the Grosse Pointe of North Woodward.” But the community was quickly and repeatedly tested by a series of challenges not unlike the challenges that have tested the great city of which it is a part. How it chose to meet those challenges goes a long way in explaining Detroit’s revitalization today and, more fundamentally, in explaining what it means to be a Detroiter. Sherwood Forest is a neighborhood that works, and the “how” and the “why” of that makes for an inspiring and instructive story for anyone interested in the concept of community and how it was achieved in one of the most fascinating places in urban America. Gail Rodwan is a lawyer and 47-year resident of Detroit’s Sherwood Forest who, over the years, served on the Board of Directors of the Sherwood Forest Association in a variety of capacities. When the neighborhood decided it wanted to chronicle the history of Sherwood Forest on the centennial of its founding, she saw the perfect opportunity to share with others the story of one special place. Gail Rodwan is a graduate of Kalamazoo College and Michigan State University/Detroit College of Law. To purchase the book, use the form to the left. All proceeds from the book go to the Sherwood Forest Association for neighborhood improvements.